Category Archives for "Caesars Dad"
Swansea, What do you want to go there for? The traffic there is bloody terrible and all the shops are closed. The ones that are open sell overpriced rubbish and they now charge you for plastic bags. It’s expensive to park and you’ll probably get your car broken into anyhow. 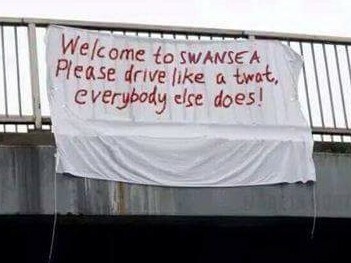 You don’t want to go down if the Swans are playing as the traffic will be worse. No point going to the pubs in Swansea either as a pint is expensive and they are full of drunks especially on the weekends. If you want a cooked breakfast, don’t eat at Swansea Market as you can get breakfast for a few pounds from Tesco’s instead. And the Gower? It’s over rated with nothing down there but beaches. The traffic there is awful and it is likely going to rain. Bloody windy down there where you’ll catch a cold. Why don’t you stay in and watch TV? Not that there is anything on TV anymore but lot of repeats. I particularly like watching travel shows. Not that I would go to any of those place: Too expensive.